Yoga Pants Syndrome. Just because everyone is doing it, does not make it profitable. Jack Butala: Welcome to the Jack Jill Show, entertaining real estate investment advice. I am Jack Butala. Jill DeWit: And, I am Jill DeWit, broadcasting from sunny Southern California. Jack Butala: Today, Jill and I talk about the yoga pants syndrome. Jill DeWit: Oh, boy do I have a lot to say about this. Jill DeWit: Where did you come up with this? Jack Butala: It will be a rated-G rant, but there will be a little bit of ranting. Jill DeWit: I can’t wait to hear. Jack Butala: Everybody knows what this is, right? Jill DeWit: I don’t think they do. We’re going to have to explain what this is, first. Jack Butala: Okay, before we do that, let’s take a question posted by one of our members on the jackandjill.com online community, it’s free. Well, now we have an answer here. Callie responded, “Hi, Joshua. This is how I price my offers. My process is similar to what Kevin describes … ” When I [inaudible 00:01:49], there’s a bunch of conversations in here. Jack Butala: There are lots, actually. Jack Butala: And, a video. Jack Butala: She actually goes so far, Callie does, to put a video in there, and she shows how she prices. It’s actually pretty amazing. Jill DeWit: Aw, that was really nice. Talk about people helping people. Jack Butala: Subsets are the key here. Jill DeWit: “At this point, I have account of sales by subdivision priced per acre, for each sale, and the average price per acre for the subdivision.” Gosh, this is just so good. It’s making my heart feel so good. Jack Butala: It’s very, very similar to the way that I do it. I add a few steps, but she is dead-on here. Jack Butala: Both of them. Jack Butala: If these questions, listener, seem boring or confusing, this is not for you. In fact, real estate investing is not for you. Real estate investment is not about picking out wallpaper. Jill DeWit: No, it’s not. Jack Butala: It’s about sitting on a computer in a dark room for 10 hours, analyzing data. Jack Butala: Specifically to come up with both of what these people are talking about: Pricing property. Jill DeWit: There is no mystery. Jack Butala: If you are in a subdivision where houses are selling like hotcakes for 100 grand, are you going to buy it for 120? I’m over simplifying, but this happens. We see people do this all the time. Jack Butala: They throw their hands up and they say, “I did everything I told you to do.” No, you didn’t anything we said. Jill DeWit: Don’t buy it like that. Exactly. Jack Butala: Or, if you try to send a mailer out where properties are selling like hotcakes for 100 grand, for $22,000.00 you’re going to fail. Jack Butala: Turn off the HGTV, and take a math class, or an Excel class. Jack Butala: I’m not joking around at all. Jack Butala: Here’s the thing, it’s hard in this venue, in this format … this audio format we’re on, to explain pricing beyond how I just did it. It’s hard to really read her description, in my opinion. I think it’s just easier to see it on a video, and she talks all the way through it, writing an Excel spreadsheet. So, I’m not plugging the forum. I’m just saying if you want to know how she prices it, and I completely sign off on the way she does it. Again, I’d add a few more steps at the end, because price per acre for land is scaled up and not based on size. 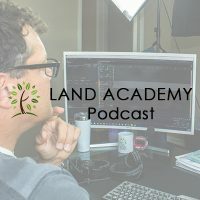 If you have a 40 acre property and a five acre property, and you’re at $100.00 an acre, or $1,000.00 an acre, the higher you go up, actually, the cheaper it’s going to be, price per acre. Jack Butala: Mm-hmm (affirmative), the concept is totally correct. Jack Butala: I price how … insofar as housing mailers, it takes a long time. Jack Butala: With land, as long as it’s rural acreage, I’d take the shotgun approach. With houses, I take the rifle approach. It’s simple. Jack Butala: Measure twice, cut once situation. Jack Butala: Today’s topic: Yoga Pants Syndrome. What is it? Why do you need to know about it? Jill DeWit: I just snorted, sorry. 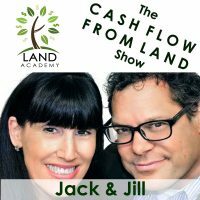 Jack Butala: What does it have to do with real estate investing? Jill DeWit: What does it have to do? Jack Butala: Let’s talk about what it is. Jack Butala: Asher Boots, because it was in Michigan. Jack Butala: Almost like Dickies, almost. You know? Jill DeWit: We didn’t know. That wasn’t us. Jack Butala: After a while, you get a little bit older in life and you say, “You know what? That just doesn’t matter. I have more important things to do.” Or, maybe you don’t. Maybe you never grow up. Maybe, your girlfriend wears yoga pants 24/7. Jill DeWit: Oh my gosh. What is that. Jill DeWit: I sure hope you’re not wearing yoga pants. Jack Butala: This does not happen, because that person has that job for a reason, and he knows the other VP of acquisition in the other reads, trust me. They don’t all run around in a pack together wearing the same clothes and looking at the same deals. Jill DeWit: Could you imagine? Jack Butala: They go and do different stuff. Jill DeWit: They have matching suits, matching watches, matching shoes. Jack Butala: And, matching buildings. Jill DeWit: That’d be hilarious. Jack Butala: You don’t do that. Jill DeWit: That’d be so funny. Jack Butala: You spend a lot of time being creative and unique. Jack Butala: And, developing new ways to buy real estate. Jill DeWit: That’d be great. Jack Butala: That’s what we do here. Don’t get caught up in the Yoga Pants Syndrome if you’re buying real estate. Jill DeWit: Oh my goodness. Jack Butala: That’s what this is about for me. Jill DeWit: That’s not what I thought this was. Jack Butala: What’d you think it was? This is where it’s fun. Jill DeWit: Yeah, so it was during that whole thing, too. I’m walking around going, “We should not be seeing all this.” It’s like I want to cover my kids’ eyes. So, we started counting. It was so funny because we walked … do you remember this? Jack Butala: Yeah, I do. Jack Butala: What Jill means is we were counting the number of people that actually had yoga pants on. Jill DeWit: As they would pass us. Jill DeWit: We would say the number out loud, but the person didn’t know. Jack Butala: “One,” the other person would say, “Two, Three, Five, Six.” It was that. Jill DeWit: We just kept the number going. Jack Butala: A chorus of number counting. Jill DeWit: Oh my gosh, and it was funny. I’m in the airport, and I find myself doing, “106,” I can’t stop doing it. Jack Butala: Why do women copy each other like this? Jack Butala: I’m hoping you have some magical answer. Jill DeWit: Here’s what I was thinking about. Is it lazy, or are they trying to impress somebody? Do they really want us to think that they worked out, because I look at some of them … you know what, we were at breakfast the other morning, and I’m looking across the table at these two women wearing yoga pants and workout jackets. Full makeup, full hair. I’m like, you cannot tell me that you went to the gym like that, and you still look like that. Because, if you did, you didn’t do anything. Jack Butala: Yeah, they probably sat around and talked. Jill DeWit: Exactly. No, they just got up, put those clothes on as part of their wardrobe and look good. I’m like, “I just don’t get it.” I honestly don’t understand, and the only time I wear exercise clothes is if I’m going to exercise, and then when I come home, I take them off. Jack Butala: A lot of years ago, the thing to do was to carry around a Starbucks cup. Jack Butala: I had this exact conversation with a group of people over drinks. This was a lot of years ago. I asked, re-asked, asked, and re-asked and asked 50 times, “Why is everyone carrying a Starbucks cup around?” Mostly, because the people I was asking had Starbucks cups. Jill DeWit: What was their response? Jill DeWit: I don’t think yoga pants are a status symbol. Jill DeWit: Don’t close the deal in yoga pants. Jack Butala: Yeah, never. Well, you should never wear yoga pants. Never. Not even to yoga anymore. If you do, be creative about it. Don’t just wear black ones. Jack Butala: Pick some cool ones that don’t have see through calves. Jack Butala: If I sound angry, it’s because I am. Jill DeWit: My former trainer in Arizona had some really cool ones. Jack Butala: That’s what I’m saying. Jill DeWit: They were like print ones, and they were awesome. That’s her life. They looked great on her. Jack Butala: Because she’s a yoga instructor. Jack Butala: She’s supposed to wear yoga pants. Jill DeWit: She should wear yoga pants. Jill DeWit: You know what? I’ll tell you, she would not wear them 24/7. Jill DeWit: She did it all the right way. Jack Butala: Thank you for wearing … the correct way to wear yoga pants is by Jillian … what’s her last name? Oh, we can’t use her last name. Jill DeWit: Don’t need the last name, thank you. Jack Butala: Jillian in Scottsdale, who is about to get married. Congratulations. Jill DeWit: Mm-hmm (affirmative). Here is my other thought. I’ve even seen them in the wrong, wrong places, by the way. Should you really wear yoga pants in first class? Jack Butala: What were you doing in first class, Jill? Jill DeWit: That’s where I sit. Where do you sit? Jack Butala: I sit in Seat 1A. Jill DeWit: That’s my seat when you’re not with me. Jack Butala: When we fly commercial, actually, it’s Seat 1A. Jill DeWit: Thank you. I like that seat. Anyway, so don’t be a sheep? Is that what you’re saying? Jill DeWit: I did 200 a week. Jack Butala: Right, 20 a day. Jack Butala: My kids are still licking the envelopes. Jill DeWit: Yep, there we go. Exactly. Jack Butala: Tell me, why did you get that grade in math? Jill DeWit: Why do you have a Band-Aid on your tongue? Paper cut. Jack Butala: Because, dad, he made me lick 400,000 stamps last night. Jack Butala: What’s wrong with you? Jack Butala: Do it again. Jill DeWit: I have paper cut. Don’t do that to your family. Do not do that to your family. Jill DeWit: Or, your friends. Jack Butala: Your children deserve to go to school and be able to pay attention. Jill DeWit: This is a new punishment. This is it, you’re licking the envelopes tonight. Jack Butala: I see people do this, with lack of creativity and no imagination, they just follow other members around. Jack Butala: You know, we have a member who knocks it out of the park, Luke Smith. I guarantee Luke Smith is not wearing yoga pants, figuratively. Jack Butala: Maybe literally, I don’t know. Jill DeWit: I hope not. Jack Butala: Maybe that’s what he’s in to? You know what, he’s the only guy who would be wearing the yoga pants that I know of, and maybe it’s okay. Jill DeWit: Well, all his videos that he does, and he has a lot of them when to sell his properties, they are all from the waist up. We really don’t know. We’re going to have to ask him next time on our call. Jack Butala: Exactly. Oh my gosh, yes, you’re right. Jill DeWit: We’re going to remember that now. Jack Butala: Someone’s going to bring that up. Jill DeWit: Someone [inaudible 00:15:01], we’re going to all ask him, “Luke, what are you wearing? What kind of pants are you wearing? Please don’t say yoga pants.” Can you imagine, Jack, if I put you in yoga pants? Jack Butala: No. I can’t actually imagine that. Jill DeWit: That would be funny. Jack Butala: That gets me thinking about a bunch of other stuff that we can’t talk about on the air. Jill DeWit: Okay, got it. Jack Butala: Well, you’ve done it again. You’ve wasted another 15 minutes listening to the Jack Jill Show. Join us tomorrow when we discuss how to scale your business like it’s a franchise. Jill DeWit: Nice. And, we answer your questions. Should you have one, post it on the jackjill.com online community. Go there, put it in, we might answer it right here for you. Jack Butala: It might be a video, too. Jack Butala: You are not alone in your real estate ambition. Jill DeWit: I’m trying to imagine you in yoga pants. Jack Butala: You know what it is, too? It’s the same thing, like these guys that ride these bikes real fast … those pedal bicycles? Jack Butala: I exercise that way, but I don’t dress up like a clown. Jack Butala: I wonder what that’s all about, too. Jill DeWit: I know. They get a little too into it. Jill DeWit: It’s kind of weird. I agree. Jack Butala: It’s not just women. I’m glad we thought of that. It’s not just women at all. It’s just people, their lemmings. Jill DeWit: Exactly. Don’t be a sheep, but do share the fun by subscribing on iTunes, or wherever you’re listening. While you’re at it, please rate us there. Both: We are Jack and Jill.